The METOC OccFld is the only earth science related OccFld in the Marine Corps. The METOC service OccFld is responsible for collecting, assessing and disseminating METOC intelligence relevant to friendly and enemy force strengths and vulnerabilities for the planning and execution of operations necessary to characterize the battlespace. This includes atmospheric, space, climatic and hydrologic intelligence for use in the production of Tactical Decision Aids (TDA) and METOC effects matrices. The METOC OccFld is comprised of MOS 6821, MOS METOC Observer, MOS 6842, METOC Forecaster, and MOS 6852, METOC Impacts Analyst, and is progressive in nature. Marines entering the 6800 OccFld will complete formal training and receive MOS 6800, Basic METOC Marine and will participate in routine METOC service function while training for a designated MOS within the OccFld. As their skill-enhancing training progresses, they become eligible to attend further formal MOS instruction. 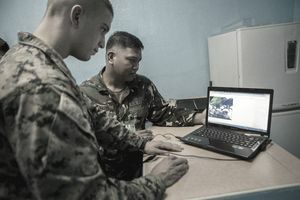 Billets include assignment to MEF, MEU, Intel Battalion, METOC Support Team (MST), Marine Wing, Support Squadron, Marine Corps Air Station and Facility, TECOM, CBIRF, NMOPDC and instructor duty at MARDET Keesler AFB, MS.